Fracture and Squeaking in Ceramic-on-Ceramic Bearings: Is It Really a Concern? 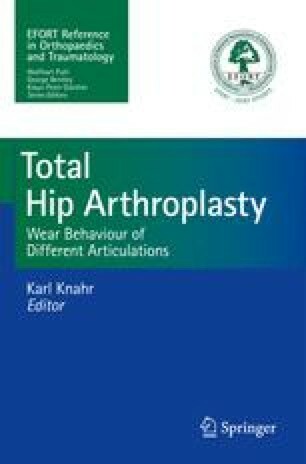 With an increasing demand for endoprosthetic treatment of patients leading an active and demanding lifestyle, the need for optimizing tribological properties of implants has arisen. Minimum wear rates are required in order to secure longevity of the implants. In comparison to metal-on-polyethylene, ceramic-on-polyethylene or metal-on-metal bearings, ceramic-on-ceramic bearings show the lowest wear rates. The linear wear has been measured at 0.005 mm/year, and the volumetric wear at 0.04 mm3/year. Furthermore, the minimum risk of ionization of ceramic particles guarantees excellent biocompatibility. Excellent clinical results with a reported survival rate of more than 85% in cementless fixation at long-term follow-up of a mean 19.7 years have been documented . However, ceramics still have a reputation of being unreliable due to first generation ceramics, which have been linked to an increased risk of fracture of ceramic components with reported fracture rates of up to 13.4%. Consequently, an uncertainty amongst surgeons developed, and other bearings were thus favoured. However, with the introduction of improved manufacturing processes and designs, the fracture rates could be dropped dramatically. The fracture rate reported for contemporary ceramic heads ranges from 0.002% to 0.2% propagated by the manufacturer (Source: Ceramtec™) to 0.004% and 1.4% in clinical reports, and the risk for liner fracture is assumed to be as low as 0.01–2%. Ceramic-on-ceramic bearings have shed the stigma of high fracture rates and are nowadays acknowledged to be the material of choice for the high-demand, young and active patient. Recently, numerous reports on audible phenomena generated by ceramic-on-ceramic bearings have been published and caused new concern. A distinct squeaking noise has been reported in between 0.3% and 10.7%. Various other noises like clicking, grinding or grating can reach an incidence of 32.8%. Up to date, the aetiology is still unclear and most likely multifactorial. Multiple studies have linked it to prosthetic design, malpositioning of components, edge loading, stripe wear, bone stock and patient activity levels.